Flower Festival: ‘Words into Blossom’ … and now linked to a free concert with the ‘Tregadillett Songbirds’ choir! St Mary Magdelene Parish Church will this year host a major Flower Festival. 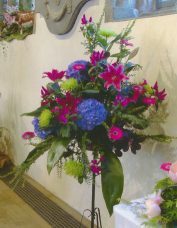 Some of Cornwall’s most talented flower arrangers will fill the church with displays that will surely trigger a thousand photographs. Each display will interpret a poem, line or phrase from the work of Charles Causley. STOP PRESS! And now, there’s also a free concert from the ‘Tregadillett Songbirds’ choir on the Saturday afternoon to enjoy amongst the floral displays, as well!